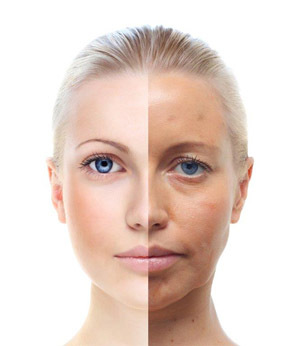 Skin changes are among the most visible signs of aging. Evidence of increasing age includes wrinkles and sagging skin. As we age, skin loses its elasticity, volume, and becomes thinner and drier. Large pigmented spots (called age spots, liver spots, or lentigos) may appear in sun-exposed areas. Tighten sagging skin, decrease wrinkles, reduce skin irregularities , achieve a radiant, healthier, younger-looking complexion – without the scalpel and all in one session with FRACTORA. Fractora is a fractional ablative (tissue removal) micro-needle radiofrequency device that is the latest advance in non-surgical skin rejuvenation and skin tightening. It provides anti-aging improvements in skin texture, tone, and firmness for a more youthful radiant look. Fine lines and wrinkles are filled out, thread veins and superficial age spots disappear. It offers improvements for aging skin that would normally require two, three or even four different technologies. Fractora is unique in that it targets the problem of loss of elasticity and thinning of the dermis (the deep layer of the skin). It provides dramatic skin and wrinkle improvement by fractionally ablating the skin and restructuring deeper tissue. Fractora delivers waves of radiofrequency energy to the skin, at varying depths, via tiny pin electrodes that gently heat the deep layers of the skin in a controlled way to stimulate the production of new collagen and elastin for skin rejuvenation. The matrix of tiny pins provides a uniform fractional ablation of the skin that promotes skin resurfacing. The untreated (intact) skin between the pins serves as a healing reservoir that promotes faster healing of the tissue and quick recovery. Patient downtime is minimal. Fractora can be used on face and body areas that can benefit from skin renewal. It can be used on areas of fine lines, crow’s feet, smoker’s line, deep wrinkles, loose sagging skin, poor texture, redness, pigment irregularities or discoloration like brown spots, depressed scars (like acne scars), stretch marks, and superficial spider telangiectasias (small dilated blood vessels). The most common areas of treatment are the lower face, jowls, smile lines, forehead, crow’s feet, cheeks, mouth and neck. Fractora skin resurfacing and rejuvenation can be customized to your concerns and to your needs. Depending on your Fractora treatment regime you can expect to have between 1-6 sessions with treatment intervals of 4-5 weeks. Most patients see visible improvement in the quality of the skin as soon as the initial swelling and redness subsides. Visible results are seen at about ten days but typically, the most noticeable results appear after two weeks. Improvements continue up to three months after the last treatment, due to the continuous production of collagen. How will I look after the treatments? For the first 48-72 hours the skin will be red and irritated. It is advised that during this time you frequently apply a moisturizer. Expect to see micro scabs a few days after treatment and slight swelling and bruising for the first week. Recovery is a week to ten days. Noticeable results include improved skin texture and tone, wrinkle reduction and superior skin tightening for a healthier, radiant, younger-looking you. When can I put makeup on after treatment? Within 2-3 days most patients can apply a mineral based makeup and participate in their usual activities. Frequent moisturizing of the treatment area is essential. Avoid direct sun exposure. Use of a good, broad–spectrum sunscreen (SPF) everyday to reduce wrinkles, slow the aging process and reduce future risk of skin cancer.. Yes, Fractora can be used in the same treatment session, or a few days after other treatments. It can be combined with injectables such as facial dermal fillers and/or Botox. If you are interested in addressing wrinkles, loose saggy skin, uneven pigmentation and skin tone all with one treatment, FracTotal Facial can be suitable for you. Dr. ChinQuee can design a customized treatment plan that meets your individualized needs. Coined “Designer Dermis”, Dr. ChinQuee is able to tailor your results using Fractora’s ‘multiple tip approach’ that allows various layers or depths of the skin to be targeted depending on your specific skin condition and recovery preferences.